Home Twin Flame Essentials Soul Mates vs Twin Flames – What are the Differences? 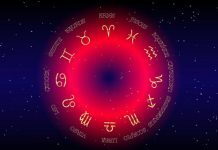 Soul Mates vs Twin Flames – What are the Differences? How do you know whether it’s your Twin Flame or your Soul Mate? 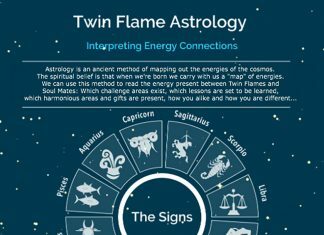 Karma, Energy, Heart Bonds, Soul Recognition… Brand new infographic covers it all – plus, a Free Tool for discovering the Truth about your Twin Connection. 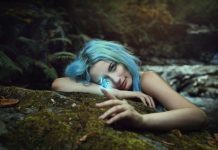 If you’re wondering whether you’re with your Twin Flame or your Soul Mate, keep the energetic nature of this connection in mind – there are many tell-tale signs of a true Twin connection but ultimately you yourself will feel it once you learn to center yourself and go within, silencing your mind and listening to your heart. Here is a short method that can help you get clarity if you’re wondering whether you’re really with your Twin Flame or not. Remember that the less pressure you put on the outcome, the clearer the answer. If you’re set on one outcome or another, your ego mind will try to interfere. So the more relaxed you can get, the more tuned in to the truth you’ll be! This is a method that tunes into energy to discern the Twin Soul connection. The Twin Flames share the same energetic frequency at their core, so it’s “all about energy”. It’s a feeling of “home” or resonance with yourself you’re looking for. 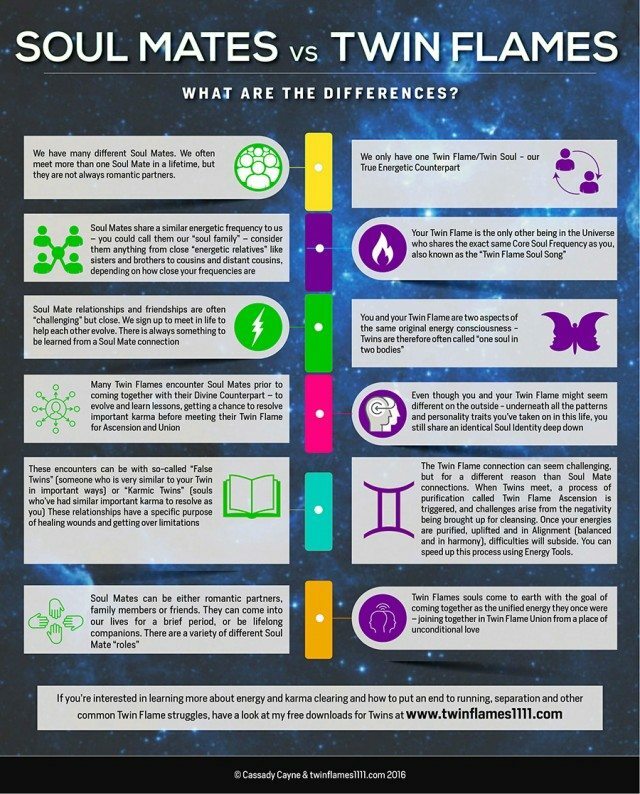 I’ve been fortunate to connect with both my Soul Mate and my Twin Flame in this lifetime, and I’ve therefore been able to learn about the differences and similarities between the connections. One strong theme has been that although my Soul Mate and I share many similar personality traits and interests in life, our energies do not seamlessly overlap in the same way that my energy and my Twin Flame’s do. With the Twin Flames, there may be both similarities and dissimilarities in personality traits and interests – but their energies fit perfectly together as two of the same. It is an identical core energy frequency, whereas Soul Mates do not share this same core frequency no matter how similar they may otherwise seem. 1) Find somewhere quiet to sit for a few minutes, turn off your phone, close your eyes and take a deep breath in and out. 2) See a bright ball of light around you, like you’re sitting safe and sound inside a glowing glass ball. Sense how this light is connecting you deep into the center of the planet and up into the source of light at the core of the universe. 3) Now, count to 5 as you breathe in, then hold the breath for 5, then breathe out for 5. Repeat this sequence three times. 5 in, 5 hold, 5 out. This helps to realign your energy and your physical body. 4) Now intend that you’re asking your Heart to show you the truth, and that the answers will come with ease and grace. 5) Visualize the person you’re wondering about, standing in front of you. Next, visualize moving over to them and stand so close that you could reach out and embrace each other (you can do this too if you feel drawn to). 6) Feel your heart against this person’s. Feel your hearts interacting. What’s the feeling? What sensations do you get in your body and emotions? (A tell-tale Twin Flame feeling is the sensation of your hearts being like magnets pulling each other closer, wanting to get impossibly close, a feeling of lightness and elation – bliss). 7) Next, visualize putting an image of this person into your heart chakra. Then listen, sense, perceive, observe what happens… Your heart will now be reacting, and you can get a sense of what it’s telling you. This information can come as feelings, physical sensations, images, words… Remember that truth feels light rather than heavy. If you don’t feel you get a clear answer or impression the first time, leave it for now, find some way to relax and make sure you clear out any energy congestion that could be getting in the way. Then return when you feel relaxed, upbeat and ready. It’s much easier to get intuitive insights and receive confirmations when we’re in a high vibration and a neutral state of mind. In general, I would not advice seeking spiritual information during moments of despair, heaviness or negativity, as you’re more likely to tune into ego and fear patterns. It’s better to calm yourself, neutralize your state of mind and emotions first, then get to “work”. Lastly, remember Soul Mates and Twin Souls are both very special connections, and one isn’t “better” than the other! Whether you are with your Twin Flame or Soul Mate right now, know that it is what’s for your highest good at this part of your journey. And as always, I’m sending you love and light for your continued journey! Want more? For an easy, fun way to manage your mindset, elevate your energy and harmonize your journey with your Twin Flame, have a look at the Vibrational Alignment Program here.